What is your approach to washing up? Do you wash by hand or have a dishwasher? If you wash by hand, do you have a set washing up liquid that you buy or do you just buy whatever is on offer? We do have a dishwasher but there are quite a few things that we wash by hand. Some because they don’t fit well in the dishwasher, some because they are to delicate and sometimes it is more a case of what they have on them. For example, we don’t like to put anything with egg on in the dishwasher. Not only does it make everything else smell funny but it doesn’t clean properly and somehow manages to bake the egg further onto the dishes. In terms of washing up liquid, I don’t buy a set brand really. It is more a case of whatever is a good price. 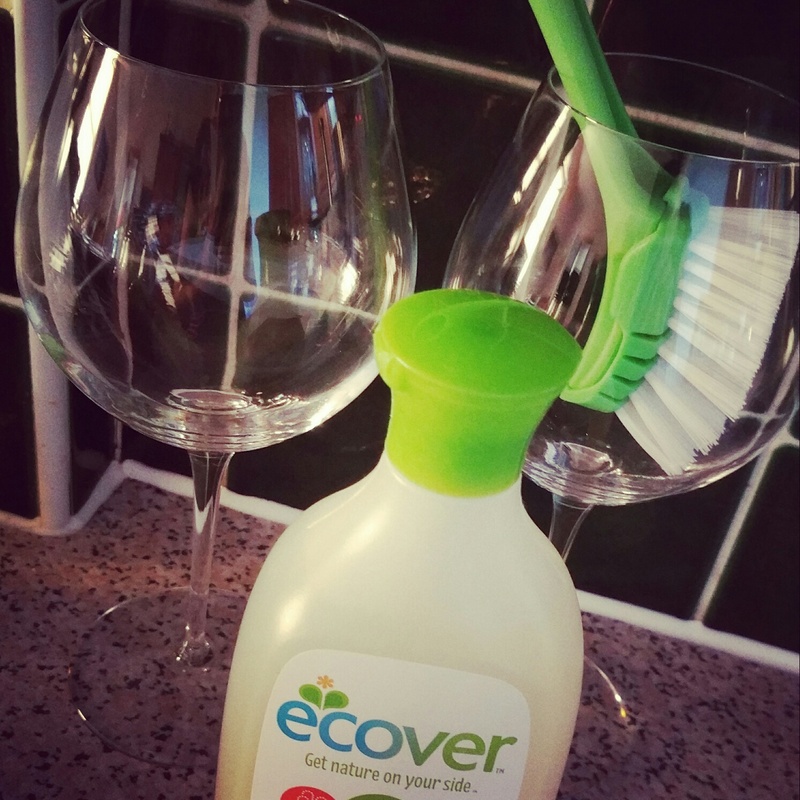 We’ve been using Ecover – the natural and green approach to cleaning – to establish if green can actually clean. The first thing that gets you about this is the smell…lemongrass…lovely. The second thing, you don’t need to use much to get lots of bubbles going (can’t wait to try this as bubble mixture for the children). The third thing is how squeaky clean everything is – look at these wine glasses. So, when I used this to get rid of scrambled egg, rather than having to scrub it away, it dissolved right off the dishes. Much less effort required than usual. Absolutely it can! 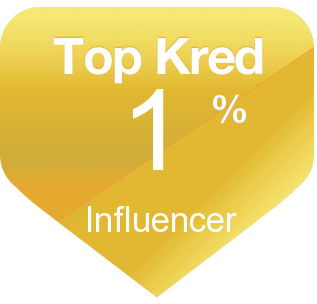 Exceptionally well. Yep! We have a dishwasher but I really like Ecover for handing washing items too. I have a few favourites actually, but Ecover is one of them. I am the same – I do like the bleachy smell I have to say, but the lemongrass in this is fab and it makes things squeaky clean. 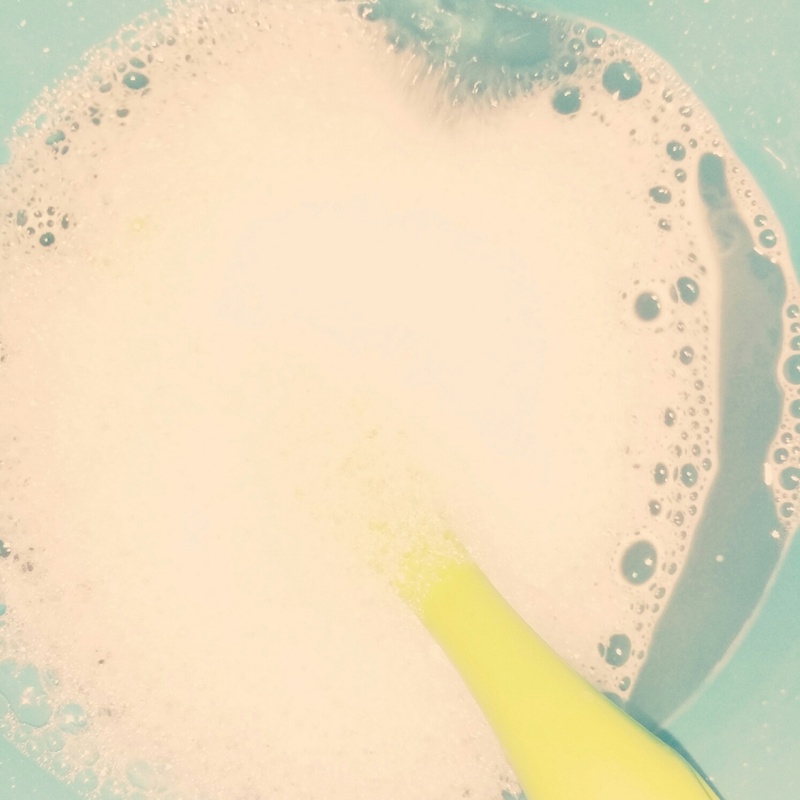 Mix washing up liquid, white vinegar and water in spray bottle to clean the bathroom. Bye bye limescale. It’s brilliant. Three quarters water, one quarter vinegar, few drops of ecover. Green, cheap, effective. Hmmm – thanks will give it a go! Much like you the majority of items go in the dishwaher – unless to big or things like knives or non-stick pans which can be damaged by the dishwasher. Love this product, if you didn’t know it was ‘eco’ you wouldn’t think twice about it. As for the smell it’s not bleachy but seeing as the smells of most brands now range from nature to food this fits in well, especially as the smell smells real not synthetic. To top this of it’s the only washing up liquid i’ve used that doesn’t kill my hands. I don’t have a dishwasher so they get wet a lot!